What's for dinner? I ask myself that question quite often, along with What's for breakfast and What's for lunch? Some days I have an easier time deciding than other days, and last Sunday was just such an occurrence. After walking almost 5 miles in the morning, having pasta for lunch and taking a nap, I wanted something fresh and invigorating for dinner. Alas, that required a trip to the grocery store, but it was so worth it! I knew I wanted seared tuna (and luckily it was on sale for $5.99/pound). My original idea was to have it along with an avocado & tomato salad, but that plan changed once I saw edamame on sale. 1. Combine the first 7 ingredients. Make sure the sauce tastes salty and gingery. Leave half of the sauce in a bowl, and put another half aside. 2. Marinade tuna in one half of the sauce. 4. Remove the tuna from the marinade and coat it in sesame seeds. 5. Heat a bit of oil in a pan (I used the same one that I used for the vegetables) and sear the tuna for about 3 minutes on each side, depending on how cooked you want it to be and how think your tuna is. 6. 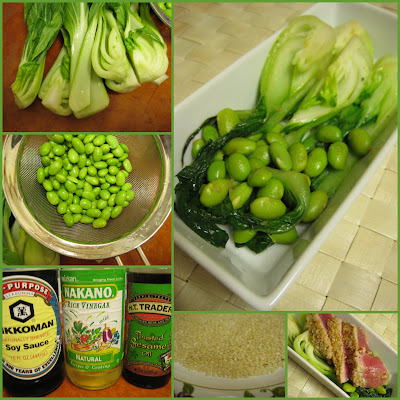 Slice tuna on a diagonal and serve on top of bok choy and edamame. What's your idea of a fresh, invigorating, quick and delicious meal? Oooh, lucky your tuna was on sale. This looks like a great meal! I have this quick quinoa salad recipe that I really love. It has tomatoes, black beans, cilantro and a lime dressing. It's easy and healthy! Seared tuna is one of our favorite things to make. We'll have to try it with the bok choy! Love everything in this dish. 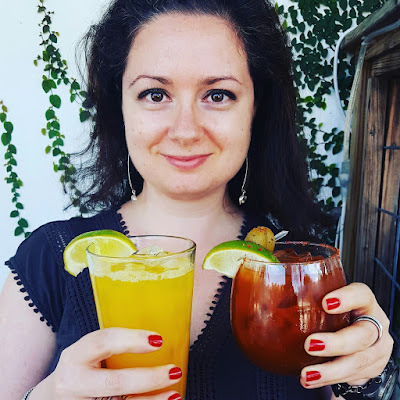 Delicious Olga. Very nice! I love the salty and gingery sauce! Your tuna is beautiful. I love seared tuna and I never make bok choy though I love it too...will remember to get some at the market next time! So pretty and fresh-looking. Must have been a great meal! After a long walk or workout I like a dish of pasta with tuna and veggies!! oh yummy! looks soooooo good! Digging your collage making skills.... Love tuna cooked this way. Other people think it's disgusting but they've obviously never tried it. rare tuna > cat food any day of the week. This looks nice and simple and tasty! Nicely cooked tuna!